Sticking true to our promise that we want to remain the biggest and most varied night out in town, and to help heat up the final days of summer/early autumn or whatever it is, this month we've drafted in some specialist bass selectors to rock the house in room 1. Presenting DJ's SPEC-K, LIGHTSIDE, DEPHECT, MR L and guests, the cream of the Frome bass driven scene dropping the biggest, murderous b-lines on the dancefloor..i'm sure most of you guy's know what this means.. BOOM! Room 2 witnesses residents DJ BARRY BREAKS & VJ ULTRA dropping their funked out brand of dancefloor funk and beats and visual gems, GHETTO FUNK STYLE! There's also a fantastic opportunity to catch a rare DJ set from INVISIBLE SYSTEM head honcho DAN HARPER.. we'd need a whole day of your life to list Dan's many achievements as a super-talented-musician, so to give you an idea about what he's playing, it's likely to be a modern bridge between Ethiopia, Jamaica and the UK in his own way, with the decks, laptops, CDJ's, maybe even a coffee machine. Just as well he know's his way around a range of kit! No doubt about it, it's worth the visit on it's own if you ask us. Be sure to check out the INVISIBLE SYSTEM facebook page too, and marvel at the amount of extremely well known musicians he collaborates with, and keeps in full time work.. it's dang impressive! 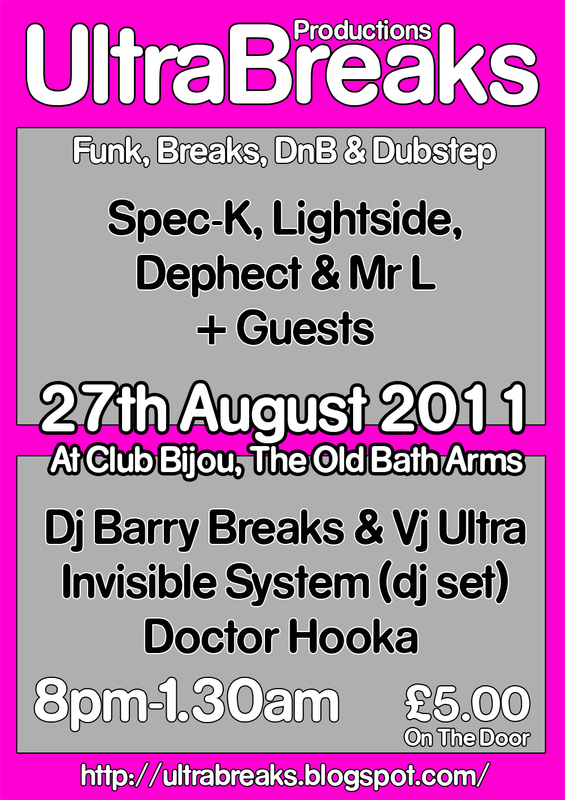 Also in the house will be local hip-hop madman DOCTOR HOOKA, back setting the scene with some killer boom-bap! 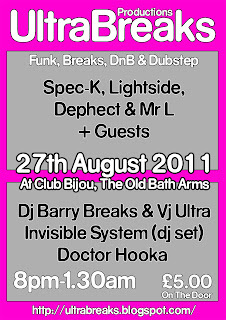 The previous UltraBreaks nights have packed out the venue, two rooms full of bouncing people. Be sure not to miss out on what is guaranteed to be another amazing night. It would be cool to check out the newest Dephect designs.